In March 2016, Rhode Island made an ill-fated foray into the wild world of state-branding. Lawmakers put $5 million into the RI Commerce Corporation’s campaign to promote tourism in the Ocean State, part of Governor Gina Raimondo’s plan for economic development. The result? A sail-shaped logo and the slogan “Cooler & Warmer.” It was a disaster. Rhode Islanders, even those who realized that “cool” was a double entendre (as in ‘hip’ and the occasional temperature of the ocean), were quick to criticize the campaign. Blunders in its rollout didn’t help the state’s case. The “We Are Rhode Island” promotional video accompanying the new slogan included footage shot in the Icelandic capital of Reykjavik. Its website featured restaurants in Massachusetts and over 100 factual errors. Governor Raimondo quickly scrapped “Cooler & Warmer” but kept the sail logo, encouraging local businesses to “make it their own.” She also fired Betsy Wall, the Chief Marketing Officer of the Commerce Corporation and a guiding force behind the campaign. Alternative slogan suggestions from the Providence Journal’s online comment section included “Rhode Island: We haven’t sent a Governor to jail for a few years now” and “Rhode Island: Close to Boston.” On Twitter, photos of Rio de Janeiro’s Christ the Redeemer and the Great Wall of China circulated with “We Are Rhode Island” bannered over them. They were a reminder that no advertisement could faithfully convey the everyday hum-drum realities of a tiny state sandwiched between other bigger, more culturally significant urban centers. A 2013 Gallup poll found that only 18 percent of Rhode Islanders thought their state was “one of the best possible places to live in,” the lowest percentage of any state in the nation. And yet, “I never leave Rhode Island” bumper stickers are a common sight. For every bit of negativity around the Ocean State, there is also pride. Take Warwick native and URI grad Lara Salamano, hired to fill the vacant Chief Marketing Officer position at the Commerce Corporation in the wake of the “Cooler & Warmer” fiasco. “I love Rhode Island,” she told the Independent, “I grew up here. I left for 20 years, [then] I left a thriving career in New York so I could raise my kids here.” One might expect to hear this from someone tasked with boosting the Ocean State. But talking to Salamano, you get the sense she means it. Salamano has indicated that the Commerce Corporation will not be attempting a full-scale rebound campaign this year. Instead, at the end of January, it released a series of seven-second promotional videos of recreation opportunities around the state, ending with the tagline “Rhode Island: Fun-Sized.” Poking fun at itself, the state is using the campaign to make its small size an asset. Within the cliché-soaked terrain of state-branding, Rhode Island’s latest efforts are perhaps some of the most honest. “Cooler & Warmer” flunked, but it brought out the best in Rhode Island cynicism, maybe saying more about the state than an ad campaign ever could. Now, “Fun-Sized” has embraced the state’s contradictions while continuing to try to sell Rhode Island to the rest of the nation. Broadly speaking, state tourism slogans are the domain of dad jokes and hyperbole. Some make sense, drawn from well-known geographic features (Missouri – ‘Where the Rivers Run’) or cultural tropes (New Hampshire – ‘Live Free or Die’). But most range on a spectrum between generic (Pennsylvania – ‘Pursue Your Happiness’), head-scratching (Connecticut – ‘Full of Surprises’), and laughable (Idaho – ‘Great Potatoes, Tasty Destinations’). In 2016, states budgeted an average of $20.1 million on destination marketing, according to data from the US Travel Association, with oft-visited states like California spending about three times that. Salamano explained that tourism is the fifth largest industry in Rhode Island, employing 80,000 people. The state-level promotion done by the RI Commerce Corporation is funded by a five percent hotel and room tax, diverted for this use by state lawmakers. Salamano told the Indy that tourists spent $6 billion in Rhode Island in 2015. She touts the financial benefits of attracting out-of-state visitors and businesses. According to the Commerce Corporation’s 2015 economic impact study, tourism generated $719 million in state and local taxes that year, equivalent to $1,750 in taxes per Rhode Island household in the absence of the visitor economy. But the measure of success for state tourism campaigns is often silence—no objections or public ridicule. One does not have to look far for examples of botched place-branding. In 2013, Floridians condemned their state’s ‘Perfect Climate For Business’ campaign logo, which featured a large orange tie, saying it reinforced exclusionary gender norms in the workplace. Florida dropped the slogan this year. 2014 saw NYC & Company, New York City’s official marketing and tourism organization, name Pennsylvania-born and Tennessee-raised Taylor Swift as the city’s “global welcome ambassador.” The announcement was timed with Swift’s single “Welcome to New York,” which was called a “gentrification anthem” by Jezebel, echoing broad-based criticism of the notion that a wealthy, white out-of-towner should represent the city. These examples show that while officials may tout tourism advertising’s economic benefits, this kind of branding carries implicit messages about who is wanted in the state. Reading between the lines of Rhode Island tourism campaigns illustrates this dynamic. 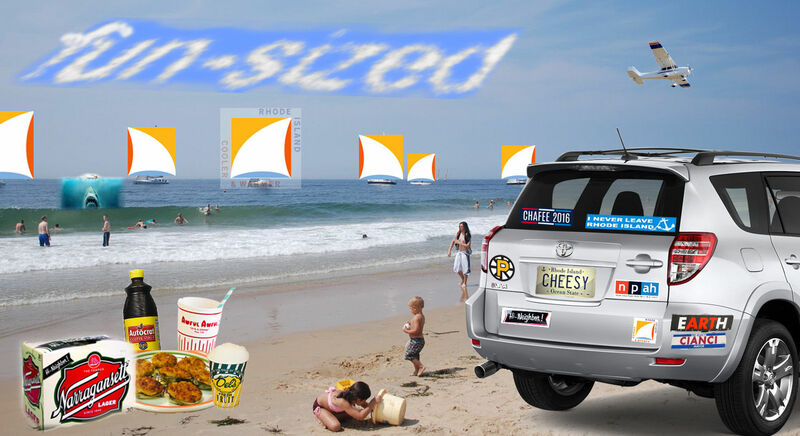 The white sail of the “Cooler & Warmer” logo and the upper-class forms of recreation depicted in the “Fun-Sized” campaign suggest that the Commerce Corporation is focused primarily on reaching those with economic capital. According to Salamano, the ongoing “fun-sized” branding is partly meant to “bring millennials into our fold.” The slogan was released via a series of seven-second videos, meant to be placed on travel sites. They feature shots of people rock-climbing in Lincoln Woods, kayaking in South County, and birdwatching on Block Island, which quickly pan out to a wide aerial view of each location and the slogan. “We looked at what really differentiated Rhode Island from all the other states, and it’s our size,” Salamano said. She explained that “the food, the drinks, the culture, the museums, the mansions, the beaches” are all easily accessible—without the crowds of New York or Boston. When questioned on the decision to brand the state with an advertising slogan first attached to candy bars, Salamano said the videos reflect a form of self-deprecating Rhode Island humor. “This is how we are; we never take ourselves too seriously,” she told the Indy. Salamano acknowledged that Rhode Island has historically struggled to be a place of economic well-being, for a long time boasting one of the highest unemployment rates in the country. Times are changing, she said: “We’re not the underdog anymore.” She hopes the “fun-sized” videos will be a rallying point for Rhode Island pride. For future inspiration, the RI Commerce Corporation might turn to their state song, “Rhode Island, It’s For Me.” It was written by Charlie Hall, a local comedian and founder of the “Ocean State Follies” troupe, who make a living satirizing their state. The song is an ode to over-the-top campy place-branding: cheesy rhymes (“don’t sell short this precious port!”) mixed with over-wrought images (“water rich with Neptune’s life”) and odd-ball humor (“Residents who speak their minds, / no longer unaware”). It contains no illusions of greatness, just unabashed tongue-in-cheek pride. It works. It’s funny, weird, and self-aware—just like Rhode Island. LUCAS SMOLCIC LARSON B’19 can name all 50 state slogans.